I must admit, I am a bit partial to a bit of “Dirty Bird” (a nickname I use for KFC). It’s especially helpful with a hangover, and one of the only options when you’re dying on your feet – a grease fest extraordinaire. There is an Asian alternative however which packs flavour and avoids the traumatic queues in The Bird. Prepare and marinade the night before so all you need to do is dust the chicken and cook without leaving the house. You’ll thank me. You really will. Combine all the marinade ingredients and coat the chicken. Leave for at least an hour or overnight in the fridge. Just before cooking, heat the oil in a pan to about 7-8 cm in height until hot. Dust the chicken well in the flour and pat gently. 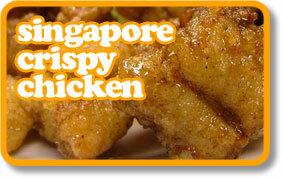 Lower the chicken into the hot oil in small batches and fry, turning often to avoid sticking. Be careful not to overcrowd the pan as you’ll reduce the temperature of the oil too much and end up with horribly greasy chicken. Take the chicken out, drain on paper towels, patting off the excess oil. Cool slightly if you can wait, and serve with the cucumber.